Theological seminary founded in 1869 by Sir Moses Montefiore in honor of his wife, Lady Judith Montefiore, at Ramsgate. Kent, England, near his residence, East Cliff Lodge. It mainly took the form of a bet ha-midrash attended by elderly men of learning who studied the Talmud there. The first principal was Dr. L. Löwe; after his death, in 1888, it languished for a time, till an attempt was made to convert it into a modern theological seminary under the principalship of Dr. M. Gaster, who largely increased the library by judicious purchases. The experiment lasted from 1891 to 1896; but it proved unsuccessful. 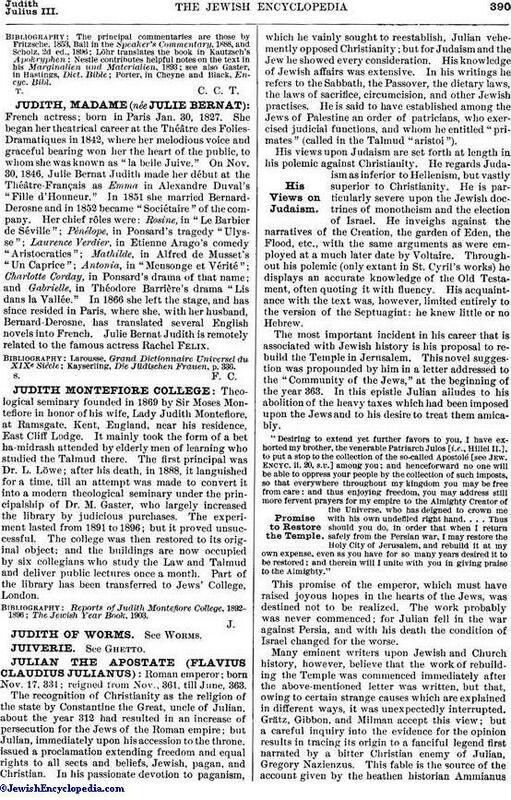 The college was then restored to its original object; and the buildings are now occupied by six collegians who study the Law and Talmud and deliver public lectures once a month. Part of the library has been transferred to Jews' College, London. The Jewish Year Book, 1903.